The Triumph Speed Triple is a phenomenal motorcycle. In 1994, the newly launched Triumph Motorcycle Company became one of the first manufacturers of a new type of motorcycle called the Streetfighter. This new class of bike was a modern sport-bike without the plastic fairing. The new Triumph Speed Triple was first released in 1994, and was named in honor of the historic Triumph Speed Twin was called the “Speed Triple”. The original 1938 Speed Twin was powered by a 498 cc vertical twin cylinder engine, and was considered a high performance machine in its day. The new Speed Triple was based on the new Triumph Triple series of modular engines, which also powered the standard Trident, Daytona sportbike, and the Thunderbird retro bike. This engine came in two displacements as a triple; 750 cc for some European markets, and 885 cc for all other markets. Early Speed Triples were all carbureted, and were designated T300 series bikes. 1994/1995 models came with the standard 885 cc water cooled engine and a five speed transmission. Subsequent Speed Triples all had the same engine with six speed transmissions. As with all the modular Triumphs, the T309 series Speed Triple had a very large single steel tube backbone frame, and used the engine as a stressed member. Front and rear suspension were fully adjustable, and were made by Showa. At the rear was a single monoshock with a progressive linkage, and at the front were standard hydraulic forks fitted with dual disk brakes. Following the T309, Triumph refined the motorcycle in a series of progressively improving generations. Following the T309, Triumph released the first of its new generation of fuel injected sportbikes, the T509 Speed Triple. The new bike was a total redesign of the basic concept. The all new engine still displaced 885 cc, it produced 108 horsepower and was fitted with an engine management system by SAGEM. Surrounding the new engine was an all new aluminium = chassis, and a single sided swingarm. These two new features combined with upgraded suspension components made the new Speed Triple a vast improvement over its older sibling in terms of handling. For 1999 the new Speed Triple was officially upgraded to T595 status and received the bigger engine. Due to tuning differences it did not make as much power as its fully faired contemporary, but it did have a substantially broader torque curve than its T509 predecessor. This made it more forgiving to ride and began a trend back to the characteristics of the original T309 Speed Triple. Cosmetically the T509 and the 1999 T595 Speed Triples were nearly identical, and they shared many of the same components. As such, they shared many of the same idiosyncrasies, as well as the dual headlamps and single sided swing arm. Small fairings referred to as “Bikini Fairings” were popular on these bikes, as well as other aftermarket accessories that wouldn’t normally be of use to a fully faired Sportbike. For the years 2000 and 2001 the Speed Triple changed little. Restyled by designer Gareth Davies, both the Speed Triple and the Daytona came to be referred to as 955i bikes. Due to its flexible engine, excellent brakes, and good handling the Speed Triple continued to impress reviewers. In 2002 there was a significant change to the engine casings of the 955i engine that decreased weight by roughly 17 pounds and the power was slightly increased. In late 2004 a small number of Special Edition Speed Triples were produced. The primary difference with this new model was an all black paint scheme, including frame, wheels, bodywork, and most engine parts. 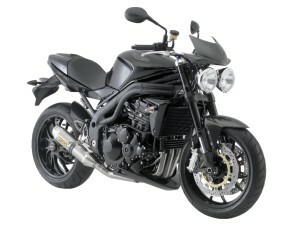 In 2005 Triumph released its fourth generation Speed Triple. The engine was still the reliable fuel injected engine used since 1997, but it had been increased in capacity to 1050 cc. This was accomplished by lengthening the stroke. Also fitted was an all new Fuel injection and engine management system made by the Japanese company Keihin. Other engine modifications resulted in a claimed 129 horsepower and an even broader, flatter torque curve.